If you haven't heard of the Drobo, you're probably not being as productive as you could be. The Drobo 5D is one of the easiest to use, simplest to maintain, and most effective enclosure bays in its field of data storage. The Drobo 5D offers room for up to five 3.5" SATA I/II/III drives and one mSATA solid state drive (drives sold separately). It handles drives from any manufacturer, at any capacity, spindle speed, and cache. You can add drives on the go—hot-swapping drives is not a problem for the Drobo 5D. But what puts this unit ahead in the storage game are the dual Thunderbolt 2 ports (Thunderbolt 2 cable sold separately). We've talked about Thunderbolt 2 before—it's 25 x faster than USB 2.0—and its data transfer rates almost approach warp speed, but more importantly, for disk arrays of this size, it reliably and safely transfers big-project data across multiple disks. Imagine having to put a crucial 200GB file on a USB 2.0 drive, as you're late for an important meeting and running out the door. You'll be delayed for ten minutes or more, trust us. The same crucial information on a Thunderbolt 2 attached drive—20 seconds. You can also daisy-chain up to six Thunderbolt 2 devices and/or a non-Thunderbolt monitor at the end of the chain. And, the bi-directional 20 Gbps performance of Thunderbolt 2 allows all devices in the chain to achieve maximum throughput. But Thunderbolt 2 isn't the only option. The Drobo 5D also sports USB 3.0 connections, which is still 12 x above the transfer rates for USB 2.0. This interface allows PC users to utilize the power of the Drobo 5D right out of the box. The Drobo 5D also uses their proprietary Data-Aware Tiering technology, usually reserved for business-class storage solutions, but also available in this desktop Drobo. It intelligently uses the high-performance flash in SSDs to accelerate performance of the storage array, allowing applications such as Adobe Premiere and Apple Aperture fast access to data. If you want a total, all-out speed/storage solution, you could load all the bays with solid state drives that are faster than spinning-based drives. And the Drobo 5D is built on the BeyondRAID technology, which features single- or dual-drive redundancy. This added layer of protection will create mirrors of one drive so that you'll always have a backup. Paired with the ability to hot-swap drives, this conceivably allows you to formulate a game plan on the fly in the case of a drive failure or power outage. Speaking of power outages, the Drobo 5D also includes a battery backup for all data in memory or cache, - anything on its way to the drives, in other words. The design of the unit has you in mind as well—it's sleek, sturdy, and has a carrierless drive-bay design so that hard drives fit closer to each other, and the unit houses a significantly quieter variable-speed cooling fan. The Drobo 5D is the perfect choice for content managers or data archivists that need speed and performance and room in one easy-to-use desktop enclosure. BeyondRaid Technology features single- or dual-drive redundancy. This added layer of protection will create mirrors of one drive so that you'll always have a backup. Data-Aware Tiering technology, usually reserved for business-class storage solutions, is also available in this portable Drobo. It intelligently uses the high-performance flash in SSDs to accelerate performance of the storage array, allowing applications such as Adobe Premiere and Apple Aperture fast access to data. The Drobo 5D is equipped with dual Thunderbolt 2 ports for daisy chaining. Connect up to six Thunderbolt 2 devices and/or a non-Thunderbolt monitor at the end of the chain. This allows even the most portable laptop computers access to high-performance storage while retaining connectivity to other devices and an external monitor. Drobo is the only storage array that offers Thunderbolt 2 and USB 3.0. This latest USB also offers high-performance connectivity and is backward compatibility with computers running compatible versions of Mac OS X or Windows, including macOS High Sierra. Drobo doesn't just protect you from a drive failure, but also from potential data loss after a power outage. Drobo Mini includes a battery that protects all data in memory, or cache, that is, data on its way to the drives. When power spontaneously goes away, the battery keeps the Drobo alive long enough for the data to be written to nonvolatile storage. The battery recharges itself and is designed to last for the life of the product. Drobo 5D is also significantly quieter than previous-generation Drobos due to its tuned, large, variable-speed cooling fan. You can even configure Drobo to spin down drives when they're not in use to further reduce noise and save energy. 5D Professional Storage Array is rated 4.2 out of 5 by 202. Rated 1 out of 5 by SkiPhotog from Unreliable over Thunderbolt I bought this unit and installed three 3TB Seagate Barracuda drives and a mSATA SSD accelerator. Everything went together very easy and was up and running within minutes. Unfortunately, when I started using the machine over Thunderbolt, it would constantly drop from my late 2013 15 rMBP. I often would return to my computer only to be admonished by OSX for improperly disconnecting my Drobo. To get the drive back up, I had to get on my hands and knees, crawl under my desk and power cycle the drive. After about a week of this, I threw in the towel and returned it to B&H. I bought a diskless Promise Pegasus2 R4, installed my Seagate drives and so far everything works much better. Rated 2 out of 5 by Papafins from Great device. Poor service The drobo works great BUT after about 6 months the fan began to make noise intermittently. I lived with it for a while but decided to get it taken care of before the warranty ran out. I contacted drobo to get a RMA but have not gotten anything but the runaround. They wanted a video of it. I sent on to them but they said it needed to be with the drives out. Did I mention it was intermittent? Imeadently after removing the drives it was still making noise. But now it is not. Did I mention it was intermittent? The noise is clearly fan. I know what a drive sounds like when it is going bad. Was going to buy extended warranty but may just turn it into a boat anchor and find a device I can get service for. Rated 1 out of 5 by Bruce Arnold from Warranty is not honored by company This unit is used to store all information for our company. It worked flawlessly for almost a 1/2 year. The unit failed two weeks ago and I've spend at least an hour a day on the phone with tech support with no resolution. They seem unwilling to supply me with a replacement unit even though the product is under warranty. They said someone by the name of Mike Siato would get back to me 3 days ago. They have even told him that our company is completely shutdown because of this problem but still no response. Highly recommend you get another backup system because customer service and replacement doesn't seem to be in their business plan. I've filed a complaint with the BBB of San Jose Calif. Rated 4 out of 5 by MacDanno from Nice, Nice. First off, Drobo's product packaging is great...bringing to mind the care and consideration of another great tech company. Kudos here! The included carry bag, with Drobo name, is a bonus! Drobo has done all the heavy lifting, so setup and configuration is a breeze. The Drobo Dashboard is a nice way to view details, manage and control the unit. So far so good. Just been using for about 2 weeks, so....not much in the way of long-term experience. Everything from installing the HDs to exploring the Drobo Dashboard interface was a nice experience. Sometimes the software fails to see the Drobo unit even tho its right on the Desktop. Overall, nice, nice. Rated 5 out of 5 by Gib from Drobo is dope, bro! 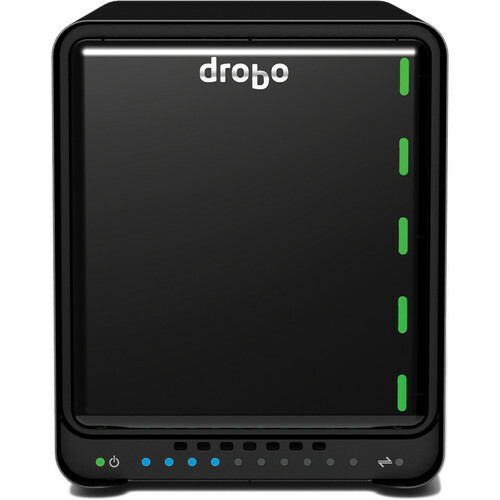 After looking into a RAID and server setup for my 2-man studio, we ended up going with a Drobo 5D. It does everything we need and was simple to set up, and we'll never need to call in an I.T. professional. We have peace of mind in the redundancy of Drobo to keep our files safe, and CrashPlan in case of catastrophe. We have one Mac plugged directly into Drobo, and the other connects via File Sharing. Transfer is as fast as we would ever need. Both have access to the same files as if on a server, and it's fast enough that we work directly on it. So far it's been a perfect, easy solution to help us sleep at night. Rated 1 out of 5 by Chirasak R. from Not Really Good Product I am a photographer. I pre Ordered on August 2012, Got it on November 6, 2012. I have 4 new hard drives and 1 mSATA SSD (Kingston mS100--64GB) in it. Everything was perfect! until 7pm. last night. It worked a whole 11 days before it failed. It shut down by itself, restarted, shut down, restarted. I could not access all of my photos and my data. I called tech support of Drobo and spent two hours on the phone with them. They could not help me.They said they would contact me in a few days. So far they haven't. I cannot access my photos and my big project is due in 3 days. I cannot recommend this product. I am going to return it for a refund. I hope somehow I can retrieve my data or I am really in trouble. Rated 1 out of 5 by Harold from I give up on Drobo I have a number of four-bay Drobos which work fairly well. I have an 8-bay which frequently gives me problems by losing volumes - good thing I back it up to other drives. I got two 5Ns to replace the 8-bay since it is old. I tried the new Timemachine volume feature on one but every time I did that, the drive went off-line and refused to come back on until I removed the disks and reset the drive. The other was working fine for a while but reported a disk being ejected, then another. At this point of course, the array was useless. No more Drobo for me. Rated 5 out of 5 by RayNM from Great to have if you need storage! I purchased the Drobo 5D to increase my storage space mostly for video and images. I purchased 3 hitachi 4TB drives and used the 2 drives from my existing WD Mybook storage to combine for a total of around 11TB of usable storage. I also used the accelerator bay by purchasing an additional SSD with mSATA drive for faster performance and page loads in Adobe. I haven't run any benchmark testing but I have noticed faster image loads in Adobe Photoshop and Premiere. Image processing is also quite faster but no numbers to show at this time. I am very happy with the product and would definitely recommend it to anyone wanting to expand their storage. what type of HDD is recommend to use? I would recommend Western digital se,re these drives are designed for RAID environments and have superior performance. Go to drobos website and there is a drive calculator that tell you what drives you can safely use. Answered by: NICHOLAS DIANA K.
What is the best/safest way to transport a Drobo 5D with 5 hard drives inside?I have two offices, one at home and one at work, and sometimes i need to move my Drobo from one to the other. But i'm very nervous to move it around as i believe it could damage the hard drives.Is this a viable concern, or is it quite safe to move? Drobo suggests removing the drives before transporting. Get some drive cases, and carefully move everything. Also, make sure everything is backed up in case something does happen! How much is the maximum capacity Get it from drobo 5d? I have 5x 4TB drives, but am reaching the maximum capacity with double disk redundancy. Has anyone tried putting HGST 6TB drives in the Drobo 5D? Does the Drobo 5D come with a thunderbolt cable? Mine only had the usb3 cable in the box. My 5d I ordered from Amazon a couple years ago did come with a thunderbolt cable. The Drobo 5D includes a 6ft. USB 3.0 cable, power supply and quick start guide. It does not come with a Thunderbolt cable. It originally did come with a Thunderbolt cable, but that was removed in March 2014. Sorry for the confusion. Is it recommended to use a mSata SSD with 5 4TB hard drives? Will the mSata help the performance? Most definitely!The array gets faster the more drives you have, but it's no comparison to when you have the msata. If you want it even faster, don't worry about the msata, just install all ssd's, assuming of course you are rich! If not, the msata is the way to go. I install a 240 gig in each of my Drobos, but the manufacturer says that 64 gig is more than enough. Hope this helps! I have a second generation Drobo and want to migrate to the latest Drobo 5D. Is it just a matter of taking the hard drives from the old Drobo and plugging them into the 5D? We do have migration paths that are supported. The 2nd Gen 4 bay to the Drobo 5D is one of them. There are step by step instructions on the Drobo website for how to do this as well. &lt;a href= http://www.drobo.com/resource-center/migration/ target= _blank &gt;http://www.drobo.com/resource-center/migration/&lt;/a&gt;But all you need to do is update the firmware on both units, power everything down, move the drives into the 5D, and turn it on. Your disk pack, volumes and data will all be transferred. The only thing to note is that you will still be limited to a 16TB volume, where as if you started with new drives or reformatted, the 5D can support up to a 64TB volume. How could I connect this in a way that would be visible on my students 24 mac desktops? Connect to your Mac and share the drive with file sharing. Put a public share on the drobo and open up your Mac to the network. A 5N might be a better solution depending the size of the data you will share. Is the thunderbolt 2 compatible with Windows 10? Also what is the maximum output via USB 3.0? Thunderbolt works only for Mac, not windows.